Sisters freshman Diana Aguinaga (left) and senior Stephany Aguinaga pose for a green-screen photo in front of a digital Tower of Pisa Wednesday afternoon, Oct. 23, 2013, in the Billingsly Student Center at MSSU. D.J. 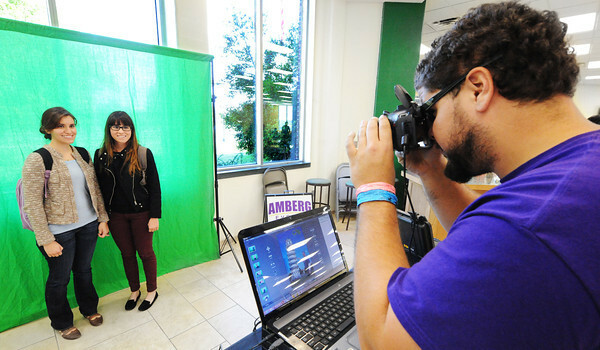 Brito of New Jersey (right), a student at Evangel and an Amberg Events staff photographer takes the sisters' photo as part of the Campus Activities Board-sponsored event.